Audubon Singing Bird Clock announces each hour with songs of 12 different birds, a different bird each hour. This Singing Bird Clock is a large 13.5 inch diameter bird clock. Cardinal Window Panel is a circular stained glass decorative panel that features a Cardinal. 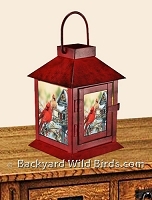 This Cardinal Window Panel has an 8 inch diameter and is perfect to dress up a window. Really brightens up a room with sunshine colors. 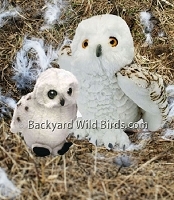 Snowy Owl Mom And Chick is a pair of plush stuffed animals. 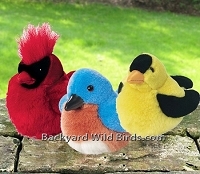 The Owls are stuffed animal squeeze birds which makes sounds of their real bird calls. Songbird Tin Bird Clock with a rustic clock face of song birds with flowers. This beautiful Bird Clock is a 15 inch diameter bird clock. 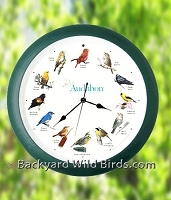 The Bird Clock has 7 of most recognized Song Birds in North America. 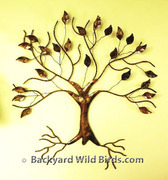 Tree Of Life Sculpture is a hand-crafted work of art that makes quite a beautiful center piece. The metal structure with Flamed Copper Plating can signify the web of life. 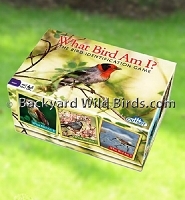 What Bird Am I Board Game is designed by birders for birders to test their species identification skills, has three levels of difficulty for novice, intermediate, and expert birders. Window Bird Srike Decals are three sets of window alerts to prevent window strikes by birds. The Window Bird Decals include 4 butterflies, 4 Hummingbirds and 2 Hawks.